that the dictator didn’t want to implement. The relationship between the state and private media had always been difficult and based on control and mistrust so much so that as early as 1990 the Mr Taha Mohmmed Nur, a former liberation fighter, and a respected elder gave up on efforts to establish a newspaper because the Ministry of Information was insisting to read everything before it was published. (c) 15 politicians that became known as the G 15. At first, the government reacted by trying to stifle the media by arresting and conscripting the journalist. 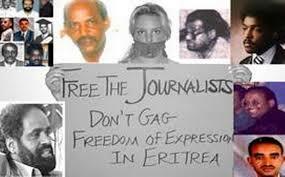 By June 2001 the Committee to Protect Journalist wrote to the Minister of Justice (Ms Fawzia Hashim) asking the whereabouts of 15 Eritrean Journalists who were believed to have been arrested or forcibly conscripted. It is a matter of record not only that there never was a satisfactory reply but also that the situation deteriorated to such an extent that by 18 September 2001 all the remaining independent journalist were arrested and all of the independent papers were closed. To date there is no independent press in Eritrea. There are no international correspondents in Eritrea. Eritrea is presently a country where the only way for people to know what is going on is by word of mouth – bado seleste (03) , bado tsciate (09) ; or arbi harenet ( freedom Friday) . When the volcano exploded in the Danakil depression in 20012, most Eritreans heard the news from the international media or from relatives in the areas affected.